In the world if anyone sneezes or a fire cracker goes on Pakistan is blamed for that. This blame game starts with signs and ends at threatening Pakistan. Declaring Pakistan center of terrorists and Pakistan’s Nuclear Program threat to the world is a common thing. But when there are incidents like; Naxalites/Mao Rebellions murder 300 soldiers in this way that no one is there to pick up the bodies. In two districts of Assam militants capture police stations after murdering all policemen and neither army nor police is ready to go for recapture. Whether these are scandals of India selling design and drawing of Nuclear Weapons or nuclear accidents occurring on daily basis, international print and electronic media ignores such news. It is genocide of Muslims or discovery of mass grave in Kashmir or any other incident of such nature, silence of international media due to influence and hold Jews and Hindus is understandable. But painful is the ignorance of such serious acts by our own media. Unluckily our media will get leisure from hypothesis about internal disputes, political problems and talk shows (which has made whole nation psychic patient) then it will be able to unveil the evil character of our enemy India. An incident of such nature occurred in 9 April 2010, in the western area of Delhi industrial area MayaPuri. In a very populated area and bazaar of industrial spare parts, in a shop the incident of presence of radio active material or spread of radiation is not common so that it can be ignored. In the capital of neighbor country such serious accident has occurred so voice should have been raised against it. Talk shows should have been held on T.V. to update international community about the threats of American nuclear deal with India and supply of Nuclear Submarines to India by Russia. World should have realized that India is irresponsible in handling Nuclear Material, its own citizens are not safe from nuclear accidents, however of whole of this could not happen. Soon Russia is going to give India Akula-2 Nuclear Submarine. In December 2004 during the Russian President Puttin’s visit to India a secret deal was signed between two countries for supply of two nuclear submarines. Akula-2 is the latest nuclear submarine and 28 cruise missiles present in it have a range of 3500 kilometers. However the submarines supplied to India will be equipped with missiles having range of 300 kilometers. The price of these two submarines is 2 billion dollars. However at that time India wants to get them on lease for ten years. For which 650 million dollar have been mutually decided, and 25 million dollars per annum will be paid separately. This amount will be paid for maintenance of nuclear submarines and payment of salaries to Russian crew. Means both submarines will be a part of Indian Navy under supervision of Russian experts, then whether Russia has no trust on India or Russia thinks Indian navy is not capable of using Akula-2 submarines. However this is not problem of the neighbors of India. The real problem is India's war obsession and irresponsible record of India concerned with ‘Nuclear Proliferation’. Due to which life of its own millions of citizens is in danger. What will be the effects of presence of nuclear submarines to Indian navy on the power balance in the area especially Pakistan, we will discuss this later. First of all let us look at nuclear accident which happened at industrial estate of MayaPuri. On the evening of 9th April after sunset owner scrap shop Gene Nath was preparing to go home after switching off the lights, when its servant pointed out something shining like stars in the dark. When the shop owner touched this yellow shining old part of iron its tips of fingers also started shining. In the meanwhile other shop keepers gathered there and touched this piece of iron. While they were enjoying the shop owner felt vomiting. In no time other people who touched the shining piece got same condition. They were rushed to a local clinic in the area, which referred them to govt. hospital due to their critical condition and informed local police about presence of radioactive material in the area. Within two hours this news spread like wild fire that nuclear material has been spread in industrial estate. Till midnight police cordoned off the whole area after evacuating it. Officials of National Disaster Management Authority (NDMA) visited the site. This night passed like that. In the day two scientists wearing protection dress examined Gene’s shop and it was discovered that radiation has contaminated the whole scrap from an old part of ‘Cobalt-60’. Presence of radioactive material in the over populated was not less than a blast for international community. Ministry of Information requested media to hide this news. Media assured of positive reporting and this happened. Indian media reported such a big accident like only two cyclists have clashed with each other on the road. Astonishing fact is that international media did not feel any need to publish this news. However some internet sites published news about incident of radiation in MayaPuri. Shop owner Gene Nath and his servant died within 48 hours. 12 persons are still fighting for life in hospital. Scienctists of Bhabha Atomic Research Centre (BARC), NARORA Nuclear Powerplant checked the 800 scrap shops with specific equipment they found that in different shops six more Cobalt-60 are present. After being declared useless by Atomic Research Centers and hospitals the fall of this radioactive material in the hands of scrap dealers itself is a crime. But in order to save its nuclear deal with USA Indian govt. wants to safeguard all responsible for this. Not only that Indian Interior Ministry after taking blood samples of 36 people working around Gene Nath have been authorized to conduct business. However keeping in view this criminal ignorance of Indian govt. two representatives of International ‘Green Peace’, radiation experts Stan Vincent of Belgium and British Vande Putte visited the Industrial Estate along with representatives of media. With the Radio Detectors they proved that whole area is contaminated by radiation and is unfit for human inhabitation and business activities and very dangerous. They warned Indian govt. not to show such hard heartedness and get all inhabitants of area, policemen and crew of hospital medically examined who gave there duty or attended the effected people. These experts also warned that in upcoming days there will be serious threat to life of these people. Now let us come towards today’s topic, the interest of Indian govt. in Nuclear Submarines. How developed nations strengthen their economy by selling their weapons and how poor countries in the desire of becoming military power of the area get blackmailed? The secret deal between India and Russia on Atomic Submarines is the great example of this. In order to get hold on Indian Ocean India has been holding talks on purchase of Aircraft Carrier (ships) since 1995. In 2004 when Russian President arrived in India the deal of these Aircraft Carrier was on top of the agenda. Keeping in view the Indian restlessness to buy these carrier ships Mr. Puttin said that in order these Aircraft Carriers it is conditional that India hires two nuclear submarines on lease. Whose manufacturing and trial period will consist of 4 years and they will cost 2 billion dollars. Russia was ready to sell these submarines but due to insufficient funds India decided to hire them on lease and a deal of 10 years was made. When these news were leaked out India and Russia both rejected them. 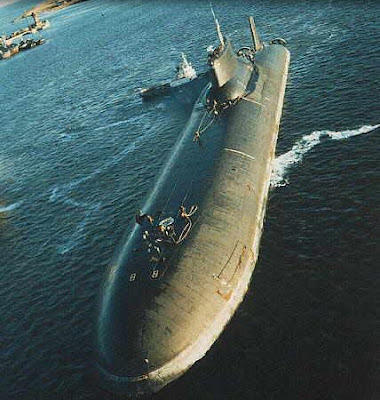 The series of this rejection went on till December 2006 but when in the same month Indian fleet of 100 men arrived in Moscow to get training of these atomic submarines, Russian Defense Ministry accepted the deal about lease of submarines. First atomic submarine was launched in the sea for trial on 27th October 2008 and in this function it was declared the first atomic submarine Akulla-2 will be handed to over India on 15th August 2009. But Indian’s Bhagwan was not happy with the occupiers of New Delhi Government’s investors on their behavior with His followers of lower caste. Perhaps that is why atomic submarine prepared for India had an accident on 8 November, in this accident 20 people died on spot and 21 were hurt, Out of these 8 have been permanently handicapped. Atomic submarine was sent for repair to the dockyard. Where submarine has been completely repaired. According to Moscow News due to shortage of funds this submarine could not be sent to trial again but according to some resources Russian crew thinks Akula-2 as cursed and is not ready to get into it. India wishes to hand over this submarine till 15th august 2010. According to Indian Naval website India wishes to get 10 atomic submarines till 2020. 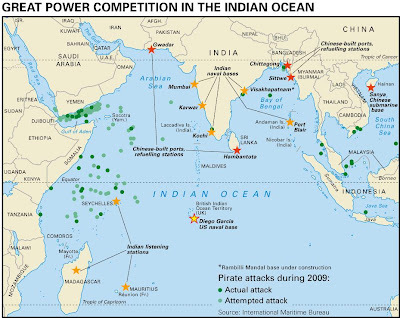 So that on the eastern and western sea-ports at least 2 submarines are deployed per coast, to counter Chinese influence in the Indian ocean. India is also declaring Pirates as threat to its Oil and Goods carrying ships.